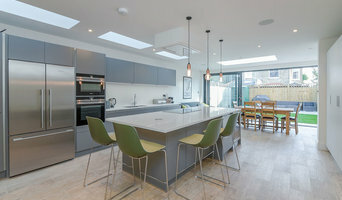 Maximise daylight in your home! We are a family run company based in Rickmansworth, but serve customers in Hertfordshire, Bedfordshire, Buckinghamshire, Surrey and London. Our expert team have a great depth of experience, and we know the importance of attention to detail and keeping our customers happy. In fact, our business has been built on customers returning to us and recommending us. Our range of uPVC, timber & aluminium windows are an ideal match for both modern and traditional homes. Window styles include standard casements with a huge number of options for fixed lights, opening sashes or dummy sashes to give windows a streamlined appearance outside. We are also specialists in bi-fold doors, sliding patio doors, and conservatories. Our highly skilled craftsmen use advanced precision machinery to ensure that every item is accurately produced. Our installation team pride themselves on ensuring you have minimum disruption whilst they are working in your home. They always leave your property clean and tidy, removing old windows and installation debris when they finish. WINDOW REPAIRS We also take on window repairs, including replacement panes, or individual window units. Simply ask us for more information! SUPPLY ONLY For trade professionals who would prefer to fit our windows themselves, we also offer a supply-only service, at a discounted price. Enjoy guaranteed quality, great service and a quick turnaround on your delivery. The Window Film Company are industry leaders in the supply and installation of window film and associated products. Providing products for functional and decorative purposes, The Window Film Company have been helping customers make the most of their glass and other surfaces since 1998. What can specialist window companies, glaziers or window fitters in Uxbridge, Greater London do for me? Specialist Uxbridge, Greater London window companies and fitters can diagnose problems and prescribe a choice of remedies, while keeping in mind factors such as the style of your property, ease of operation, budget, noise reduction, thermal efficiency (the lower the U-value, the better), durability and maintenance. It is a balancing act that only a glaziers can deftly strike. Most Uxbridge, Greater London window companies will be able to take care of both supplying and fitting your new or replacement windows, but if you have already purchased your windows from a window manufacturers then you can find an Uxbridge, Greater London fitter to just take care of the installation. Where can I find the best choice of Uxbridge, Greater London window manufacturers and window installers? Right here on Houzz. Look for Uxbridge, Greater London Windows & Double Glazing professionals in the Find a Pro category and then save images of window styles you love in an Ideabook. Take time to look through each window company’s profile and get a sense of where their strengths and specialisms lie. Make sure your window manufacturers’ work comes with accreditation: whether from FENSA (Fenestration Self-Assessment Scheme), FMB (Federation of Master Builders) or TrustMark. Find window companies and glaziers on Houzz. Narrow your search in the Professionals section of the website to Uxbridge, Greater London window companies. You can also look through Uxbridge, Greater London photos by style to find new and replacement windows you like, then contact the glaziers, window manufacturers or companies who installed them.